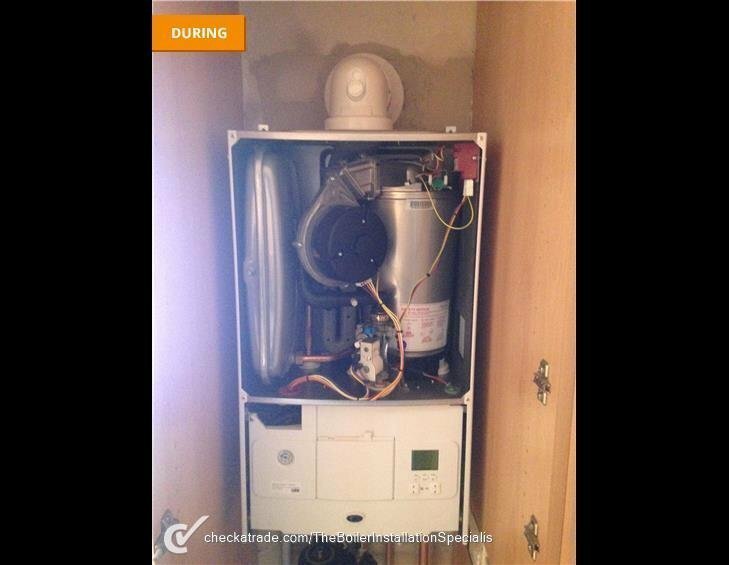 Get your new A-rated boiler and start to save money. Instant quote in 3 simple steps including supply & installation of your new boiler and up to 10 year guarantee for total peace of mind. Great boiler finance packages available to suit every budget with our 0% APR option, Buy Now Pay Later or our bank buster package - with or without a deposit you can now get your new boiler with a payment plan that suits your budget & lifestyle. 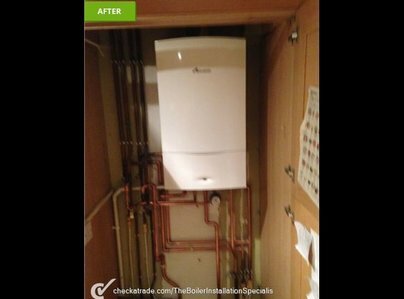 A warm welcome to The Boiler Installation Specialists Ltd. We are a family run central heating and boiler installation specialists firm covering South East of England, installing central heating systems and boiler installations up to 7 days a week. 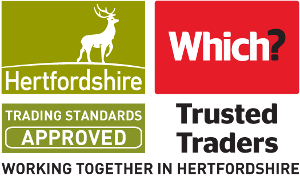 Our team of engineers have worked solidly within the industry for over 30 year & we are proud to say that we are one of the most highly recommended installation firms in South East of England. From start to finish I could not have found a better service. Nina's knowledge, advice and thoroughly efficient administrative skills were invaluable in finding me the right Worcester boiler for my home. Nina organised the fitting and how to pay for it all - a first class service. Jordan, Connor and Mason arrived promptly on the day and worked together, led by Jordan, to provide brilliant service. Courteous and professional, they explained what they were doing and we're happy to answer any questions I had. They knew exactly what they were doing and when they'd finished I had a lovely, new and efficient boiler warming my home. Plus, they were so clean and tidy the only thing I had to do was wash up the tea mugs. 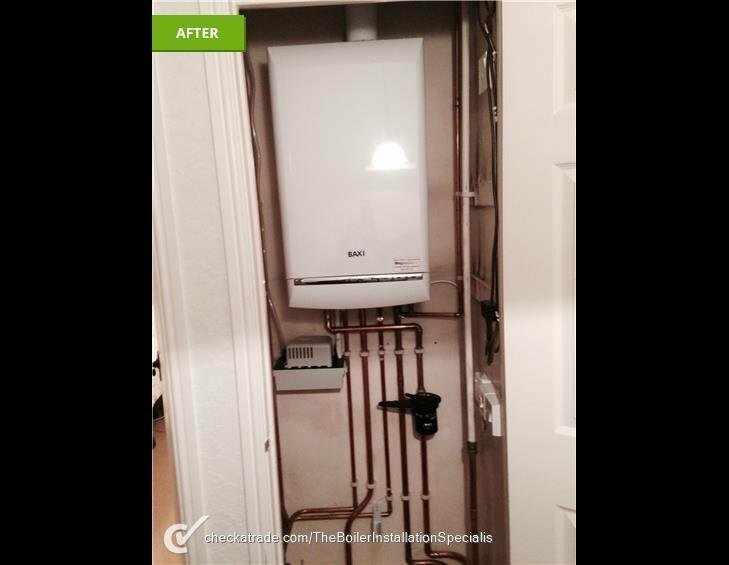 Chris, working with another gentleman installed a Worcester Bosch Greenstar 18Ri Gas Boiler. From the moment they walked in the door to the time when all work was finished they were friendly polite and considerate. Their work was both efficient and professional. The work was as quoted (no last minute extras). All work was carried out on schedule. All was made good on completion. 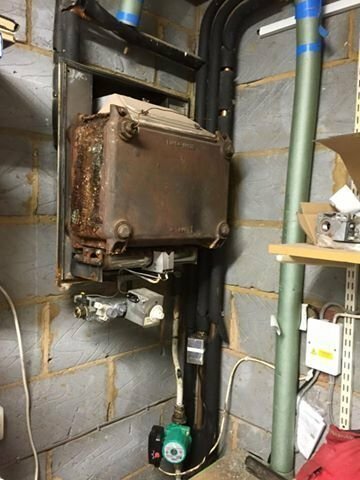 The old boiler position was not in compliance with the new regulations. As a result the new boiler was located in a slightly different position. This required a new hole for the flue. The gap left by the old flue was properly repaired using new bricks. 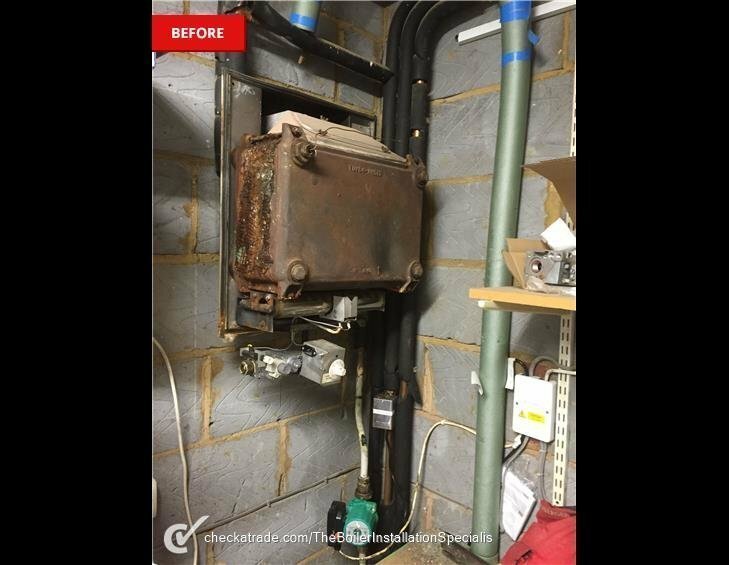 The electrical connections for the boiler and new controller were in accordance with regulations and safe. On completion the new installation was thoroughly checked by Chris. All radiators were checked for leaks and air locks these were bled as required. The boiler was also checked for any leaks. Any brick dust etc., was swept up, all was left clean and tidy. The operation of the boiler was explained. A Building Regulations Certificate was subsequently provided and the Gas Safe Register Informed. 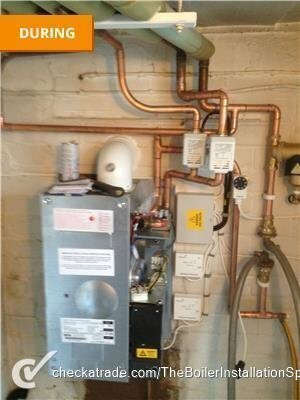 At the time of writing this review it being two months or so after the installation I remain happy to provide the highest recommendation for The "Boiler Installation Specialists Ltd" and their staff. There was a quick and friendly response to our initial enquiry. This was followed by a visit on the same day, a written quote sent immediately by email and a date agreed for the fitting of a new boiler. They turned up on time, completed the work in the stated time and in an efficient and very pleasant manner and at the price agreed. 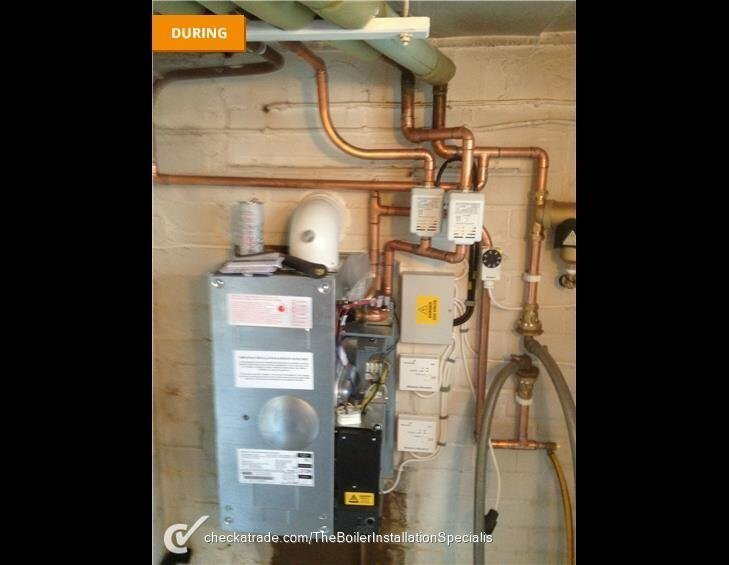 On 5th November 2018 we had a new Viessmann boiler and new cylinder and all modern controls installed. After 9 hours the new system was installed and working. The entire team of Chris, Mason, Jordan and Connor worked exceptionally well, fast and clean. The work entailed floors up, new pipes and wiring with the full system of pump, valves and thermostats. We cannot recommend them highly enough. 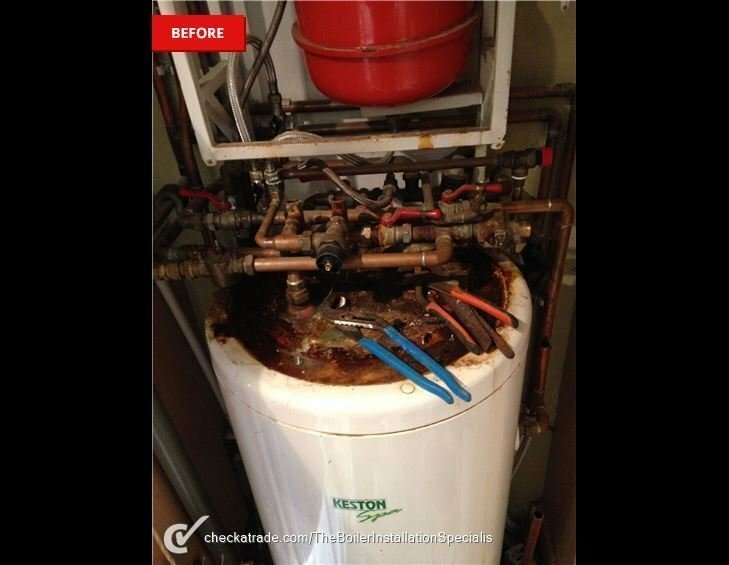 No better Boiler replacement companies out there! Couldn't recommend highly enough! OK, so we needed; 1. to replace our forty-year old gravity fed boiler with a new 'Combi' and relocate to a new position 2. Replace and relocate multiple radiators 3. Extend existing hot/cold feeds for new downstairs WC 4. Relocate existing pipework to allow for new bathroom 5. In fact, in the end we decided to replace absolutely all the pipework! I cannot fault the Boiler Installation Company in any way! From my initial contact with Nina to Chris and the guys every single aspect of their service was fast, efficient and highly professional. I would like to thank Chris, Nina, Jordan and Mason for all their hard work and attention to detail, If I ever need to- I would not hesitate to use the boiler installation company again. 3 storey town house Combi Conversion in Basildon Essex. Great experience. Competitively priced. Willing to explore options with me and explained alternatives. Intial fixed price offered over the phone which was surprisingly competitive. Followed by a free survey at my request which resulted in a better solution at lower cost. 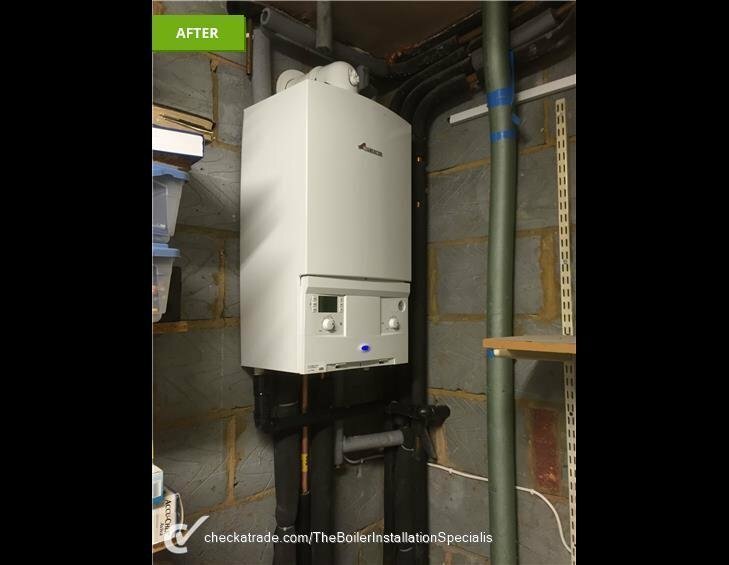 Scope: convert 40 year old, tank fed hot water and heating boiler, to a Worcester Bosch 32 CDI Compact Combi boiler with 10 year warranty. Three storey town house with 8 radiators, one bath room plus one ground floor cloakroom. 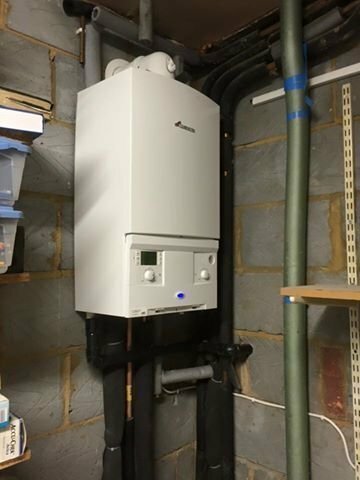 Boiler installed in garage. Engineers arrived on time and were very courteous. As one laid carpet protectors throughout, the other went through the sequence of events and asked if I had any questions since the initial survey. They started work about 8 am and by about 6pm the new boiler and flue where installed and water reconnected. All waste was removed including loft tanks, redundant pipework, old cylinder, old lagging and redundant control electrics. The next morning (another prompt arrival) saw the system thoroughly flushed, radiators bled and heating system fully commissioned. Controls were explained and warranty paperwork completed. I was sceptical that a quote "sight unseen" over the phone would be affordable but this was the most competive out of 5 quotes received and included a premium brand boiler & filter compared to other mid range offerings. I encountered a small problem with existing pipework which was sorted within an hour of reporting late on a Saturday evening. 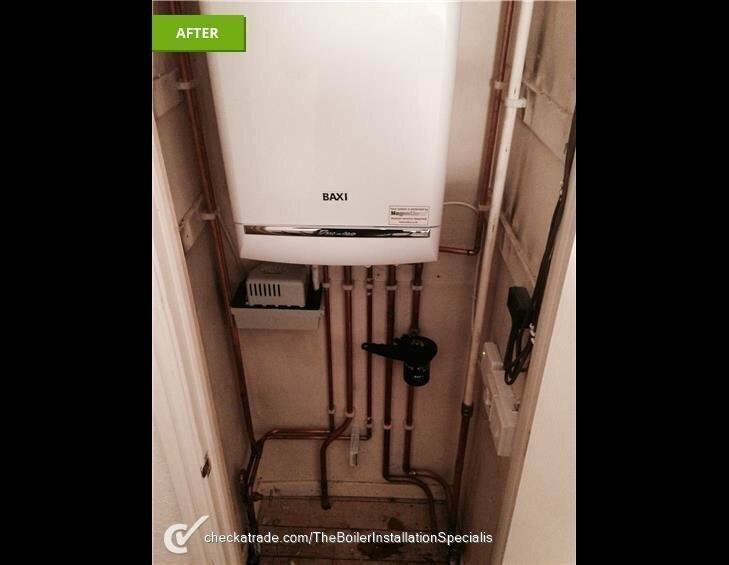 I needed a boiler replacement in a hurry and The Boiler Installation Specialists fitted the bill perfectly. From initial communication with Nina on switchboard, who was extremely helpful, to the job being carried out, I can only praise the installers work highly. 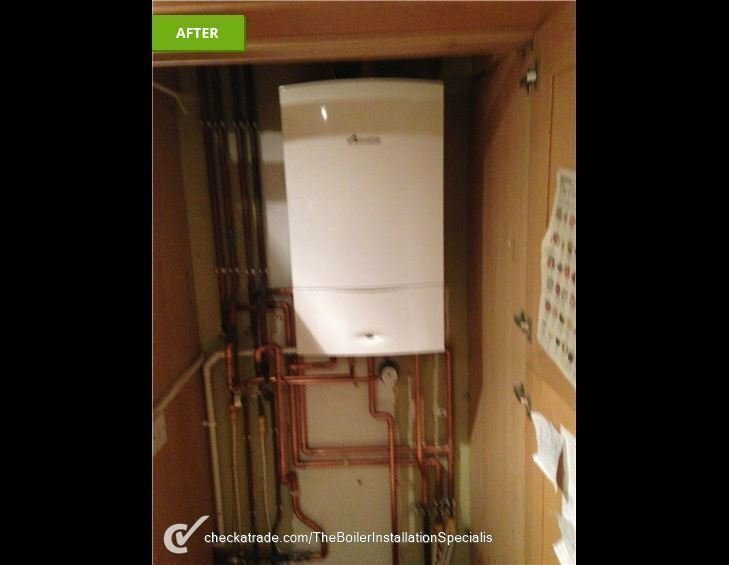 They took only two days to re-site the boiler and install a brand new one very efficiently and with no mess or complications. The price was reasonable and didn't change once agreed, I am very happy with the job and would highly recomend this firm. If you are looking for a high quality company, I highly recommend TBIS. They are the very best in the field, no compromise. I pass my thank you to Nina & engineers for outstanding quality of work & service. Highly recommended. ITBIS did an excellent job and worked so hard work when replacing our old hot air heating system with a combi boiler and new radiators. It is always difficult to have work done in the house, where lots of money is being spent, where difficult decisions need making and where things don't always go to plan! Not to mention all the mess and chaos of the work itself. However, the guys were so polite, helpful, friendly, tidy, informative and diligent that they made it all so easy and painless. And most importantly they did an excellent job: we have a super new set of radiators to keep us toasty (when the time comes!) and lovely hot water throughout which (we can appreciate now!). When an unforeseen difficulty arose, regarding a separate hot water system in our kitchen, it was dealt with quickly and efficiently. I was immediately reassured that the problem woukd be solved, and no extra cost was charged (even for the nice new tap they bought and fitted!) Nina, the business manager provided clear information and was a friendly and reassuring voice on the end of the phone (and email!) throughout the process. I would definitely recommend this company. Excellent. Fast, friendly and efficient. What luck to have this company practically on my doorstep! Friendly, helpful and prepared to explain everything without resorting to jargon, Nina was really quick to respond to my request for a quote, and at a time that suited me, unlike others who kept ringing while I was at work! The installation then took place within the week and passed off perfectly. 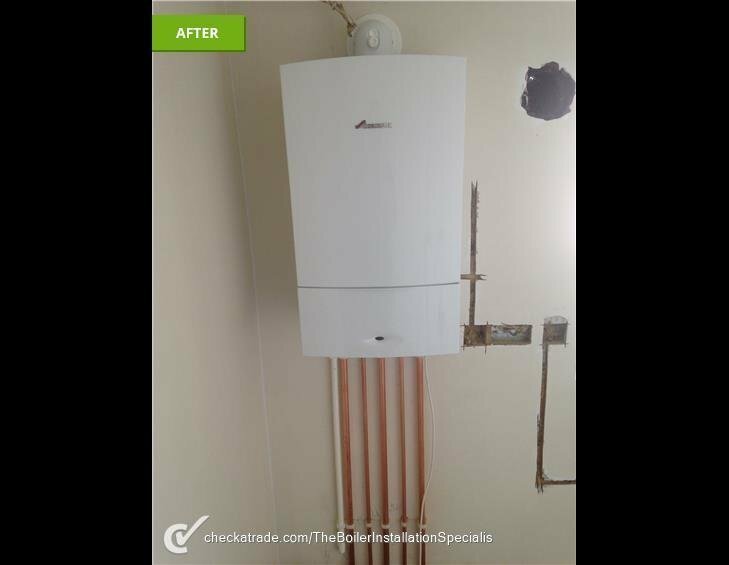 It's never a pleasure to have to fork out to replace something like a boiler, but this was as painless as could be and I cannot recommend this company highly enough.